What is the use of Mobile App and why are mobile phones created? When Motorola created the first handheld phone in 1973, their purpose was to create a more convenient way to communicate with people. However, as phones get smarter and smarter, they are not only used as a means to communicate but also as a tool to take pictures, visit social media, play games, and more. With the use of mobile apps, smartphones can do more than what they’re initially made for. Who doesn’t use SNS as their primary means of communication? Millions of accounts on Facebook, Line, Messenger, Hangouts, Skype, etc. have already been created. While it’s true that smartphones have a built-in communication system, it is usually costly and its reach is limited. With SNS, you can reach out to people from all around the world. Want to learn a new language? You can be assisted by an application. Want to look for the meaning of a word? Try an online dictionary. Advanced schools already you mobile applications to teach lessons, distribute assignments, collect paper works, record scores, and more. Educators have seen their potential in reaching out to modern learners. Business transactions are easier with mobile apps. With an app, you can monitor your orders and sales more efficiently. Also, you can reach out to more customers. 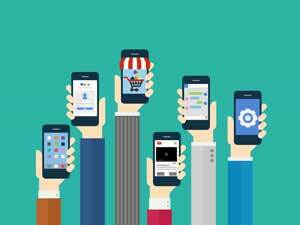 According to OuterBox, 62% of smartphone users make a purchase using their mobile devices. If you want to increase your sales, you must venture where there are lots of customers. People are cautious when it comes to handling their money. After all, it’s not easy to earn them. If you have a means to monitor your bank account 24/7, will you not grab it? I’m sure you will. Luckily, banks nowadays invest in the development of mobile app to cater to their customers’ needs better. Monitoring your weight, menstruation, and fertility is now possible through mobile apps. If you want to work out, there are apps that can instruct you and monitor your progress. This way, you don’t need to pay for a fitness instructor. Mobile apps are created to cater to the users’ needs. The more people depend on it, the more mobile app development grows. The list above is just the tip of the iceberg. There’s a lot other uses for mobile applications that have not yet been explored.